"Beyond those virtues, A TWIST OF HATE is also a darn good page-turner." "A TWIST OF HATE weaves tangled history with a picture perfect ending." When his family's priceless Cézanne disappears from a museum, former homicide inspector Del Miller leaves the investigation to the FBI. But that’s before an art dealer alleges that Del’s grandfather, a victim of the Nazi death camps, stole the masterpiece from a Paris gallery seventy years before. After the dealer is found dead, and Del's father is implicated, Del sets out to uncover the truth. 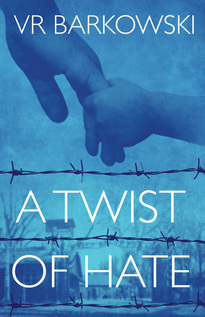 From present-day San Francisco to war-torn France, to the Nazi death camps and betrayal, A TWIST OF HATE is a story of family honor. One man's quest for answers about the grandfather he never knew, the father he idolizes, and the secrets behind a missing painting that lay buried deep within his family's past.